Ren went to live with Lisa Harrison, who lives in Tn. Check out Ren's updates Agility, Obedience and Breed! An exciting boy! May 08- A great e-mail from Ren and Lisa! December 07- Ren earned 6 obedience titles in 2007! July 07- another wonderful update on Ren! Ren completed his Rally Novice title this weekend and also got his 1st leg in Advanced Rally with a perfect 100 score and 1st place. I also showed him again in Novice obedience and he got 2nd place both days! He is a GOOD BOY! June 07- a wonderful update on Ren! 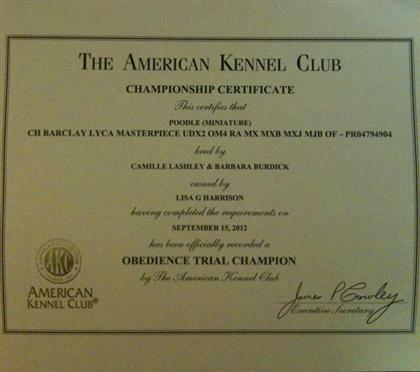 In May 2005 at age 9 months Ren began his show carrer earning his breed Championship undefeated in 2 weekends. He is currently trialing in Obedience, Rally and Agility. Ren earned his first 2 agility titles early this year and is working toward his 3rd. He earned his Companion Dog obedience title with a dogworld award this spring. 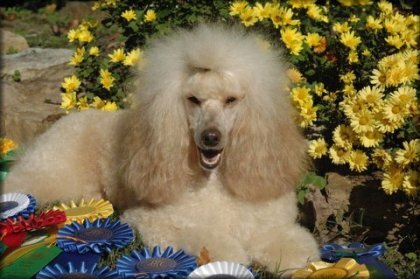 His most recent achievement was at the 75th anniversary PCA event where he placed 3rd in a very large Novice B obedience class with a score of 197. He also did very nicely in Novice B Rally in an extremely large class, placing 2nd with a score of 98. We are looking forward to more exciting trials this fall. UPDATE: Ren came in 3rd in pre novice at PCA right after he became a breed Champion at 9 months. Look for more exciting things to come.